Have you ever stopped to think about what your food looks like at the molecular level? We pretty much take it at face value when we hear that a certain food has “X” nutrient and therefore, will make us healthy. But what about moving one step further to learn about the structure of that particular nutrient and how it’s chemical formula contributes to keeping our bodies running smoothly. It’s important to remember that in their most fundamental state, foods are made up of different combinations of compounds, which are susceptible to change in response to their environment ie, how they are grown, storage, preparation and cooking. Furthermore, their chemical makeup is intimately linked with how they react once they are ingested and absorbed by the body. So why should we care or even think about this? Well, what if (in some cases) by cooking our food we were actually destroying helpful enzymes? One great example of this is how the levels of sulforaphane (a natural anti-cancer agent found in broccoli) change as we cook the vegetable. For a long time, broccoli was famous for it’s high levels of sulforaphane (SF)…so famous in fact that broccoli supplements were made and sold in health stores. Surprisingly, however, when people took this supplement they did not see high levels of SF being absorbed by the body…suggesting that the way the broccoli was processed to make the supplement led to reduced SF levels. So what was the problem? The issue stems from the fact that the SF compound is actually formed when you ingest the vegetable as the result of a reaction that occurs between two additional broccoli compounds. Heating of the broccoli to make this supplement (or cooking it at home!) actually destroys one of the two necessary components that is required for SF to be produced and absorbed by the body. In it’s raw state, broccoli contains high levels of glucoraphanin, which is a precursor to suforaphane (SF). In order for SF to form, a second compound called myrosinase (also found in broccoli) must still be present. Myrosinase catalyzes the change that occurs in glucoraphanin’s structure in order to form SF, which can then be absorbed by the body and do it’s cancer-fighting thang. Heating the broccoli destroys the myrosinase and therefore, inhibits this chemical reaction from happening. Breathe. As it turns out, naturally-occuring myosinase can be found in our stomach as well as in other foods. So even though cooking our broccoli will not yield the maximum amount of SF, we still will form some during normal digestion and can boost SF production by pairing cooked broccoli with other foods that are high in myrosinase. 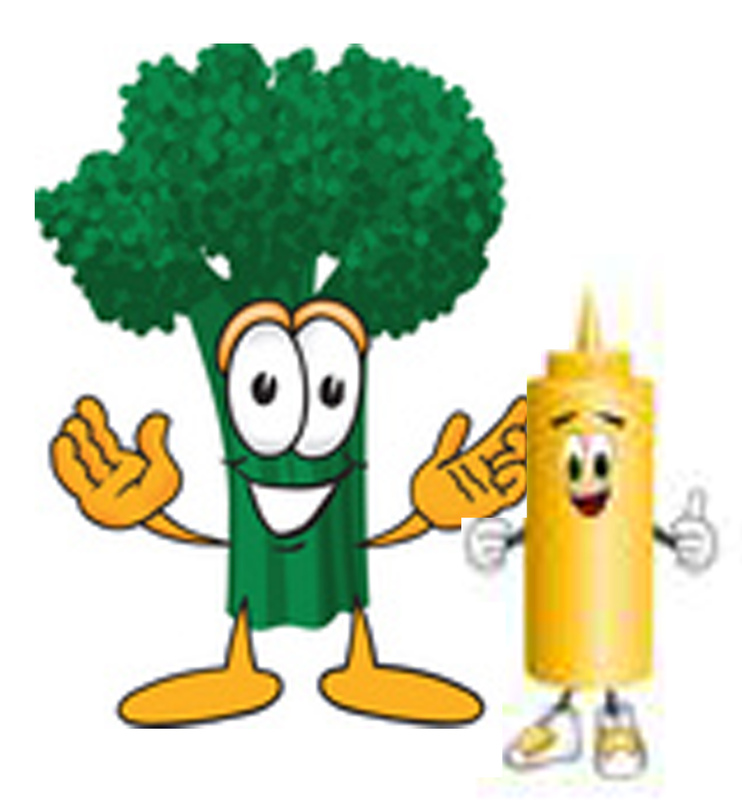 Recently, one group published in Nutrition and Cancer that healthy men fed a diet of cooked broccoli supplemented with mustard (a natural source of myrosinase) led to significantly higher levels of SF that is absorbed by the body. In line with this article, I have created a recipe for Primal Broccoli fritters that are paired with a mustard mayonnaise. I hope that you enjoy this recipe and that it will help you to remember to think about what you are putting into your body and the changes that can occur both before and after you dine. Special thanks to Mike for pointing out this amazing work! Chop broccoli into bite-sized florets and steam for 5-10 minutes, just until tender. While the broccoli is cooling, make the mustard mayo. Add the egg, apple cider vinegar and mustard to a food proccessor. Slowly add the olive oil to the food processor and blend until the mixture becomes emulsified (this will probably take ~10 minutes). After the mixture is emulsified, add the salt and move to a separate bowl and place in the fridge to cool. Wipe out the food processor and add the cooled broccoli, almond flour, cheddar cheese, parsley, salt and pepper. Pulse just until combined. Slowly add the eggs and continue to pulse just until combined. If the mixture is too wet, add a little more almond flour until the mixture sticks together. Melt several tablespoons of coconut oil in a sauté pan on medium. Make the fritters about the size of your palm and pan fry in the oil. Recipe will make about 8-10 fritters. Cook each about 5-7 minutes per side or until golden brown. 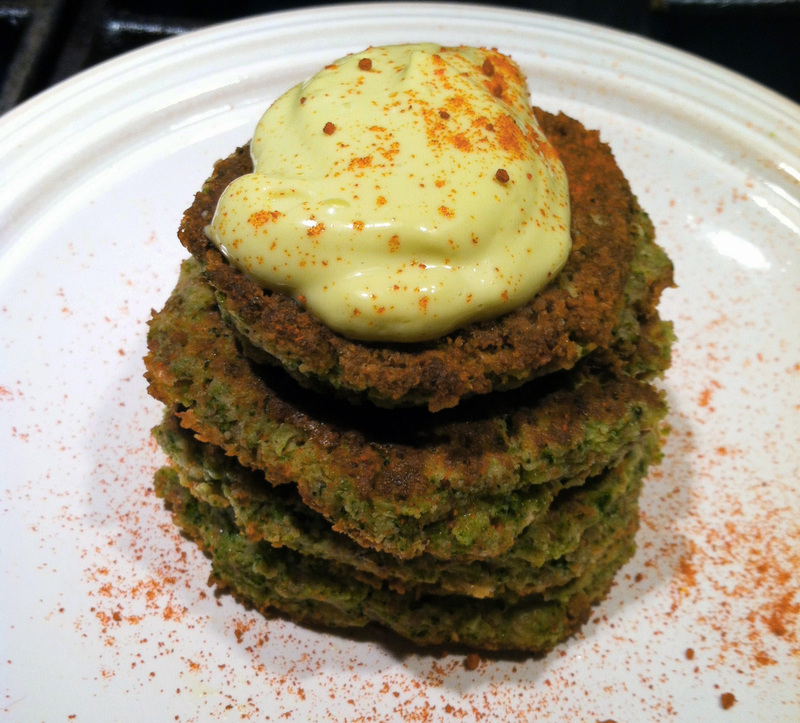 Top broccoli fritters with your homemade mustard mayo and sprinkle with a dash of cayenne. Nikki, I am really loving your blog…very fun and so tasty. Have you thought about writing a cookbook? I bet you could sell it at scientific meetings all over. Hope all is going well in Boston! Hi Michelle! Thanks so much for our support. I would really love to someday work on a cookbook. I think it’s so important to learn more about what we put into our bodies. Maybe some day… 🙂 Hope all is well for you too, I heard you moved back to Pgh? We should try to plan a grad school reunion at some point. This was a good explanation. Luv the liberal arts mindset you bring to your blog! You must have gone to a great school! 😉 Go Dicty!